Google Launched the “Communities” in google+ which looks like it will be a great place for topical conversation, like forums, and social sharing, like G+ or twitter, but allows for moderation, and for communities around a specific topic, like woodworking, so there’s much less unrelated noise to filter through. We’ve set up a community for the Modern Woodworkers Association which we’ve shared on FB, G+, Twitter, and will add a link to from our homepage. 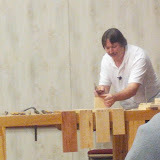 Another great community for woodworking is the “woodworking” public community. Worth checking it out. Chuck first answered our standard 5 questions. Then we went into his work. straight leg chip and dale footstool with a blah, blah . . .
Chuck balances being a woodworking personality (educator) vs a professional furniture maker (teaching/building for customers) at about a 60/40 ratio.